Heading to an event or maybe missed a presentation or unable to attend the event? Please find our upcoming presentations and past recordings. "SAP, Utopia & OpenText: The Triple Play for Asset Master Data Quality"
• Michael Jordan - Global Director, EAM Practice, Utopia Global, Inc.
"Managing Master Data to Optimize Efficiency, Reduce EH&S Risks, Ensure Compliance & Improve Productivity"
"Governing Structured and Unstructured Data for Asset Master Data Management" | Dean Fitt, SAP &Michael Jordan, Utopia "Improving Work Execution and Operations Content Management Using SAP Master Data Governance"
BITI 3 | Session ID: BT1640 "Harnessing SAP’s EIM Suite and MDG to Ensure Healthy Data for Healthcare Supplies at Cardinal Health"
"Achieve Master Data Excellence for Enterprise Asset Management"
Manage the complexity of master data throughout the asset lifecycle, from design through retirement. Govern maintenance, repair, and overhaul (MRO) data centrally to help ensure quality. Raise personnel productivity, maximize return on assets, and establish auditable records to increase compliance. "Qatargas Operating Company Ltd.l SAP Master Data Governance for Enterprise Asset Management by Utopia"
Qatargas is the world's largest liquefied natural gas company. It annually produces and supplies the globe with 42 million metric tons of LNG from across its four ventures. Join this session to learn why Qatargas chose SAP Master Data Governance, enterprise asset management extension by Utopia to help increase plant effectiveness, uptime, reliability and resource performance and optimize return on assets while decreasing operational costs. Find out how this allowed them to achieve and sustain high data quality and optimal business process execution. This session is limited to 10-12 customers to facilitate an interactive discussion and help you to better understand the challenges faced, selection process, implementation, lessons learned, and key successes. "Strengthen Master Data Governance for Enterprise Assets to Prevent Data-Related Incidents"
Managing master data is a strategic imperative for asset-intensive companies. Get it done with SAP Master Data Governance, enterprise asset management extension by Utopia. Reduce environment, health, and safety risks while increasing asset availability, maintenance efficiency, and operational excellence with improved asset information. OpenText Booth #PC24/#130 "Governing Structured and Unstructured Data for Asset Master Data Management" Thought-leading companies in asset-intensive industries realize that accurate asset master data is essential to effective operations. In fact, inaccurate or incomplete asset master data can cause a broad range of problems including increased environmental, health and safety risks, regulatory violations, reduced facility uptime, and increased capital project costs. OpenText and Utopia, both partners in the SAP Enterprise Information Management (EIM) solutions family, have joined forces to bring a solution to this challenge. By leveraging the ‘document-centric governance’ capabilities of the OpenText xECM application combined with the ‘data-centric governance’ capabilities of SAP MDG for EAM, the OpenText-Utopia solution is able to bridge the gap between document and data governance to achieve true end-to-end auditable asset master data governance. P&T Campus | SID 20326 |Theater 2 | Demo Theater "Achieve Master Data Excellence for Enterprise Asset Management"Manage the complexity of master data throughout the asset lifecycle, from design through retirement. Govern maintenance, repair, and overhaul (MRO) data centrally to help ensure quality. Raise personnel productivity, maximize return on assets, and establish auditable records to increase compliance. 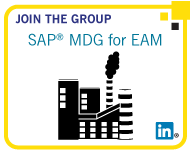 S320F | Lecture Presentation | SID EM1668 "Enterprise Asset Management with Master Data Governance" Heavy asset industries are adopting SAP Master Data Governance, enterprise asset management extension by Utopia as a way to manage their challenging asset domains. Previously, no solidified solution existed for managing functional locations, equipment, and bill of materials. We will discuss the implementation, lessons learned, challenges, and successes of the first implementation. Microforum Discussion | Platform and Technology Microforum PT416 | Session ID: PT20335 "Tame Big Data with Information Governance" This discussion looks at ways to ensure confidence in data readiness for Big Data, analytic, and predictive use cases. Learn more about metadata and semantic catalogs, along with how to merge and reconcile different data sets. Explore security and privacy policies, measuring quality, and providing lineage to establish trust in the data. Microforum Discussion | Session ID: LB20592 "Maximize Asset Use Through Better Governance of Master Data and Unstructured Content" This discussion explains how use of accurate asset master data helps improve operational effectiveness and why thought-leading companies in asset-intensive industries agree. Hear about a data governance framework from SAP, Utopia Inc., and Open Text Corporation that supports synchronized governance of both asset-related master data and documents.